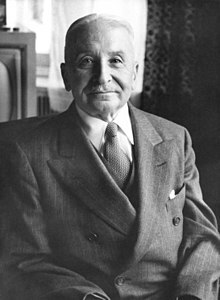 Ludwig Heinrich Edler von Mises (Galicia, Austro-Hungary, 29 September 1881 – New York City, 10 October 1973) was an Austrian-American economist, philosopher, and classical liberal. He was of Jewish descent and a prominent figure in the Austrian School of economic thought. Fearing a Nazi take-over of Europe, Mises emigrated to New York in 1940. He published his most famous work Human action in 1949. Mises had a big influence on the Libertarian movement that developed in the United States in the mid-20th century. The family of his father Arthur Edler von Mises had been elevated to the Austrian nobility in the 19th century, and was involved in building and financing railroads. At the age of twelve Ludwig spoke fluent Yiddish, German, Polish, and French, read Latin, and could understand Ukrainian. Mises was the older brother of the physicist Richard von Mises, a member of the Vienna Circle. In 1900, he attended the University of Vienna, becoming influenced by the works of Carl Menger. In 1906 Mises was awarded his doctorate from the school of law. In 1934, Mises left Austria for Geneva, Switzerland, where he was a professor at the Institute of International Studies until 1940. Fearing that Germany might take control over Switzerland, in 1940 Mises left Europe and emigrated to New York City. There he became a visiting professor at New York University. He held this position from 1945 until his retirement in 1969. He was not employed by the university, but funded by businessmen. For part of this period, Mises worked on currency issues. In 1947, Mises became one of the founding members of the Mont Pelerin Society. Despite fleeing Europe, Mises is credited for having an influential role in the economic reconstruction of Europe after World War II through his professional relationships with Ludwig Erhard, Charles de Gaulle and Luigi Einaudi. "At first we all felt he was frightfully exaggerating and even offensive in tone. You see, he hurt all our deepest feelings, but gradually he won us around, although for a long time I had to – I just learned he was usually right in his conclusions, but I was not completely satisfied with his argument". After his death, his wife quoted a passage that Mises had written about Benjamin Anderson, and said that it best described Mises' own personality: "His most eminent qualities were his inflexible honesty, his unhesitating sincerity. He never yielded. He always freely enunciated [said] what he considered to be true. If he had been prepared to suppress or only to soften his criticisms of popular, but irresponsible, policies, the most influential positions and offices would have been offered him. But he never compromised". ↑ Von Mises, Ludwig; Goddard, Arthur (1979). Liberalism: a socio-economic exposition (2 ed.). ISBN 0836251067. ↑ Mises, Margit von 1984. My years with Ludwig von Mises. 2nd enlarged ed, Arlington House, Center for Future Education. ↑ Rothbard, Murray 1988. Ludwig von Mises: scholar, creator, hero. the Ludwig von Mises Institute. ↑ Hulsmann, Jorg Guido (2007). Mises: the last knight of liberalism. Ludwig von Mises Institute. p. xi. ISBN 193355018X.